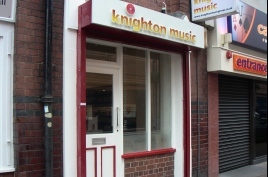 The Knighton Music group continues to trade online and as a mail order company, selling via various websites and directly to an existing customer base who used the shop. Upon returning to more website design projects in the last few years, we decided to group all our business under the umbrella of Knighton Group which became our company name in 2007. Since then we have expanded our web design portfolio and have designed websites for many local businesses including flooring, engineering, construction and electrical retail companies plus photography and music sites. You can view our portfolio of work here. Knighton Media was introduced in 2010. This area of the company provides the transfer of old media to new such as vinyl records onto CDs and video tape to DVD discs. We are currently hoping to add more ventures in the next twelve months including a new online vinyl record shop. We continued to design and manage other client websites but adjusted the focus of our business towards music retail. The business became known as the Knighton Music Group. Our record shop in Leicester, Knighton Music, began trading in 2005 and specialised in new and used classical, jazz & blues, country, folk & world music on CD, vinyl LP & DVD. Sadly, due to the constraints forced upon us by the (then) ongoing development of the Highcross Shopping Centre, which involved the demolishing of the nearby car park and the consequent lack of foot traffic on East Bond Street, the shop closed down in the summer of 2007. You can view a photo gallery of the shop from the music home page. Knighton Group started out as Knighton Internet which was formed in 1999 and established itself in the field of music websites with BIRDpages, an index of British Independent Record Dealers. More than just a directory of music shops in the UK, it developed into a popular portal site to record collecting with music news, album reviews and a collector's trading section (as our own music mail order got busier and whilst running our shop we decided to discontinue the site in 2006). We began to expand our business into designing and maintaining sites for other business users in late 1999 and now offer a full, bespoke website design service to companies requiring an online presence at an affordable price. The Bebop Shop, an online mail order jazz CD store, was added in 2000 and has become one of the UK's leading retailers of modern jazz music.